Who doesn’t love a sweet coffee vape in the morning with their blueberry muffin? 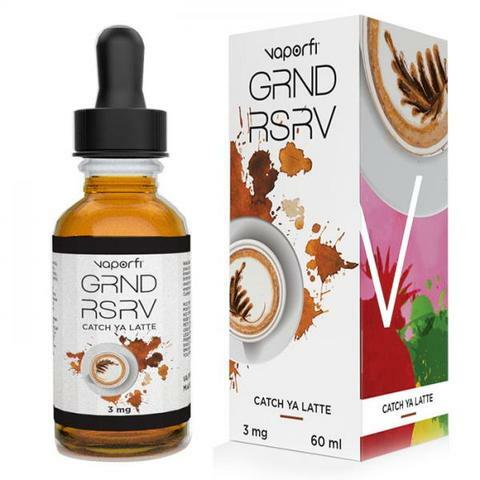 This flavor from VaporFi is called Catch Ya Latte and includes the flavors of Espresso, caramel, a little hazelnut, and some steamed milk for the perfect blend of sweetness and smooth flavor. If you’re a coffee lover this might be just what you need to start your day with a vape. Read on to find out more and to see if it might be something you may like to try. VaporFi has been producing high-quality vapor products since 2015. They make all their own e-liquids and have several specialty flavors. Their Grand Reserve line debut includes 6 flavors in total and each one is delicious and decadent.Sweet flavors that let you indulge your sweet tooth without the extra calories. This would be great for anyone who likes drinking coffee in the evening but had to stop due to the caffeine keeping you awake later. This would be a perfect switch for you. You get the flavor of coffee without the caffeine to interfere with your sleep. This is really a good morning vape when you have time to sit and lounge. I opened up this bottle and sat on my porch for a vape. It was a nice day and I was in no hurry to do anything but taste this juice. This is how I like to start every day. A hot cup of coffee and a nice flavored e-liquid for my morning vape. I am a big coffee lover so this one was right up my alley and I couldn’t wait to try it out. I have to say that this is one of those flavors that taste better at higher wattages because of the composition of the flavors. I decided since I had so many flavors in my e-liquid that I would keep my coffee plain and simple so as not to “muddle” the flavors of the two. It’s very easy to confuse your taste buds with two coffee flavors at the same time. The caramel flavor is the strongest in terms of taste. The others come in at the end to round things out. But I found that if I turn up the wattage a bit I get a little less caramel and a little more coffee and hazelnut. I liked this version because I could taste more of the other flavors and the caramel wasn’t so pronounced. It is between 70 and 75W that the caramel flavor smooths out and the others blend in for a nice rich swirl of hazelnut and espresso w/steamed milk. The most prominent flavor is caramel at the beginning. On the exhale I’m getting the coffee and steamed milk with a slight hazelnut there at the end. It’s really nice and delicious. The flavors all blend nicely together for a smooth coffee vape that leaves a nice taste in your mouth. It’s a very smooth flavor, slightly sweet from the caramel and comes together nicely at the end. Overall , it’s very delicious. The vapor production from Catch Ya Latte is pretty good. 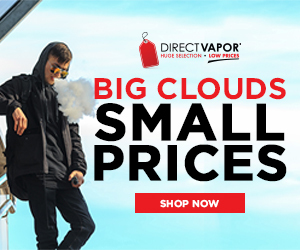 I choose formulations with a higher VG content since I use RDAs most of the time and at Max VG, the cloud production is really good. The vapor produces is thick and fills up a room pretty quick if you’re chain vaping. I switched over to my Aspire Cleito 120 tank to see how the vapor production is with a tank and it is very similar, slightly less vapor but the same quality and thickness. My atomizer coils were reading at 0.16 ohms and the wattage was set at 85W. It works well in both tanks and RDAs. It’s just a really good vape. You have to try out other settings to see how it affects the flavor. Some e-liquids taste better with more heat (higher wattages) and some flavors completely disappear, so it is important to start out low and increase a little at a time until you find your preferred vape settings. I like to start out with an RDA first so I get a really good taste of the juice itself and then switch over to a tank and see if the flavor changes any with different settings. A point to remember is to always increase your wattage slowly so as not to burn your coils or your e-liquid because then it will just taste bad. The 60 ml bottle size, which is what I have been seeing on many websites that sell this product, is selling for $25.99 and it’s a great value for such a big bottle. Premium e-liquids of this size usually go for about the same or just a little more. This is really a nice tasting juice and I would buy it again. It comes in a big bottle in nicotine strengths from 0mg to 18mg. So no matter what type of atomizer you use there is a formulation that will work for you. I really like this flavor because it has all the flavors I love in a good coffee blend. The rich espresso, sweet caramel, and creamy milk all come together in a delicious blend that I simply love. For a coffee vape it is spot on for flavor. The flavor fits the description perfectly. I think if you love coffee or just coffee type flavors, this could easily become your new favorite. I would recommend it to coffee lovers and anyone who likes slight sweet, rich flavors in a perfectly combined ratio.